What began life as a simple brief to ‘add in a new set of copy and imagery… and consider a refresh of a homepage’ has taken on a life of its own. And become not merely a minor update but a completely new website designed from the ground up. But then, we’ve always had that sort of working relationship with Cavendish Care. They have often come to us with an idea and we tend to respond with one of our ‘how about… this’ moments. Back in August I went down to Cavendish’s training centre in Horley armed with a few pages of a radically re-thought website which, following a hunch I had about expanding their branding design, gave their business a softer, more graphic look. I pitched the idea and how it could work across everything we designed. A unanimous decision was taken with an unabashed enthusiasm – let’s go for it. So began a private healthcare web design project with a very different approach than anything we’d tried before. 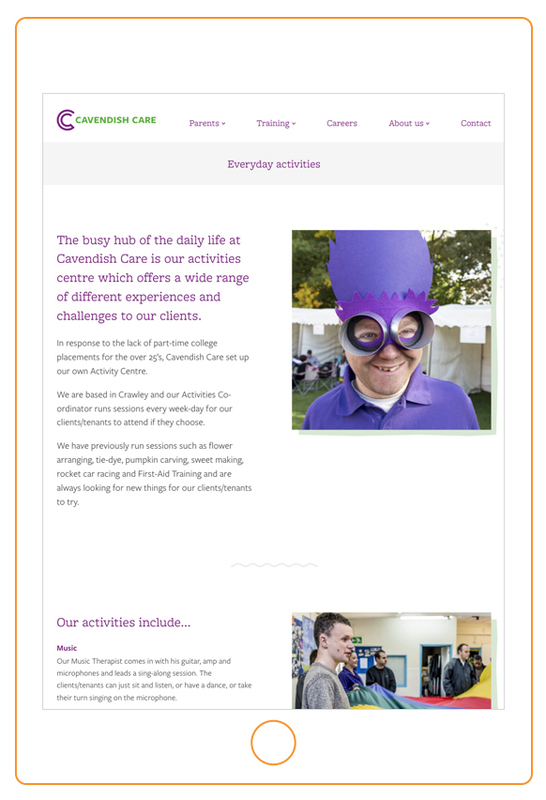 A little background: Cavendish Care run a series of care homes for young adults with intellectual and developmental disabilities and are a business we’ve worked with for over ten years. In that time we’ve taken them from having no brand or web presence to this fantastic new website covering every aspect of their work. We’re often asked by clients to improve the way their appears… just… without actually changing the identity. This project is a classic example of this sort of undertaking. And it’s a smart decision. The Cavendish Care logo appears everywhere throughout the headquarters and the multiple premises around Reigate and Horley in Surrey. Changing that just isn’t practical. However, adding in a new approach to the overall graphics and typography have given us a new visual language. This immediately makes the new website feel cohesive and appealing. These wide-ranging patterns of soft rings, clouds and waves extend to every aspect of the site. It’s a scheme that even extends to the frame behind all the photos and the way the graphics overlay the imagery. We’ve even found a way of making the graphics spontaneous and different every time. As a result every time a user opens a page they might have thought they were familiar with, it has a subtle difference from the time before. The end result is a visually appealing website where the brand extends into every corner. Subtly, pleasingly. Alongside the identity, colours and typography this new approach gives Cavendish Care a graphic language where one never existed in quite this way before. In addition to the brand design aspect of the project, we’ve also been busy on the photographic front preparing for this launch. Over a set of four photo sessions, we’ve significantly updated Cavendish Care’s image library. Since we began working on this project in 2008, we’ve always worked with Andy Rose, who has taken every single shot on the website. A good proportion of these have been taken in the last six months on ordinary days, activity-filled occasions and focussing on individual tenants just going about their lives. While Cavendish run 16 care homes, a significant facet of their work is taken up with the training and career progression of both their team and the wider care community. The Cavendish training centre in Horley is a vibrant hub for the business and as a result a large section of the new website focusses on training. With a busy HR department, there are always positions to be filled throughout the business. This inevitably involves job applications. However increasingly it has become clear that many applicants don’t have access to a computer. They might have a tablet but nearly all their job research was completed on a smartphone. Previously, applicants would need to download a form, write up by hand their form, scan it, attach to an email and send in. There are enough ‘impractical 2018 dealbreakers’ in that sentence to mean that Cavendish were missing out on valuable potential candidates. To address this problem we have developed a completely new system for them, custom built, which means candidates can fill in their application entirely online. This can easily be done on a phone, with the killer feature of users being able to stop, save their progress and have a link to the form emailed to them. Applicants can then resume the form as many times as they need to before submitting. 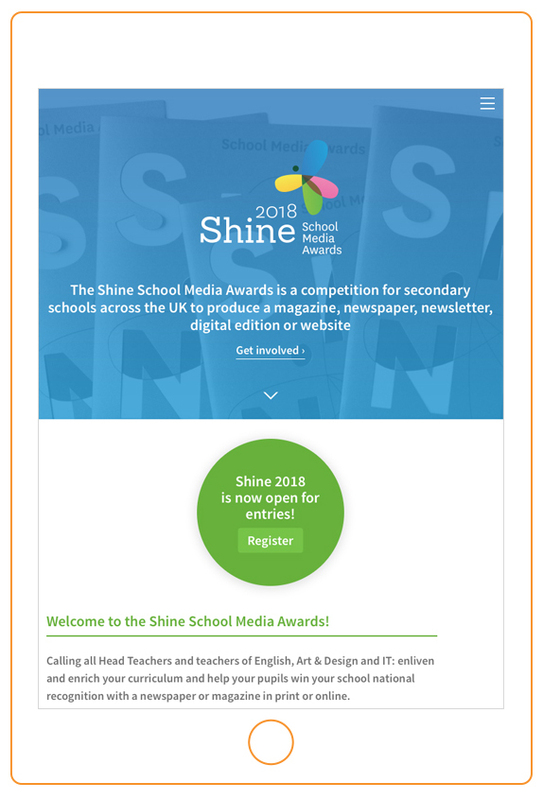 I am really excited about this – the sort of feature which previously had been restricted to huge organisations or travel visa applications. It’s such a fantastic innovation and could be the beginning of something big. Do you run a private healthcare business? We’d love to hear from you and collaborate. 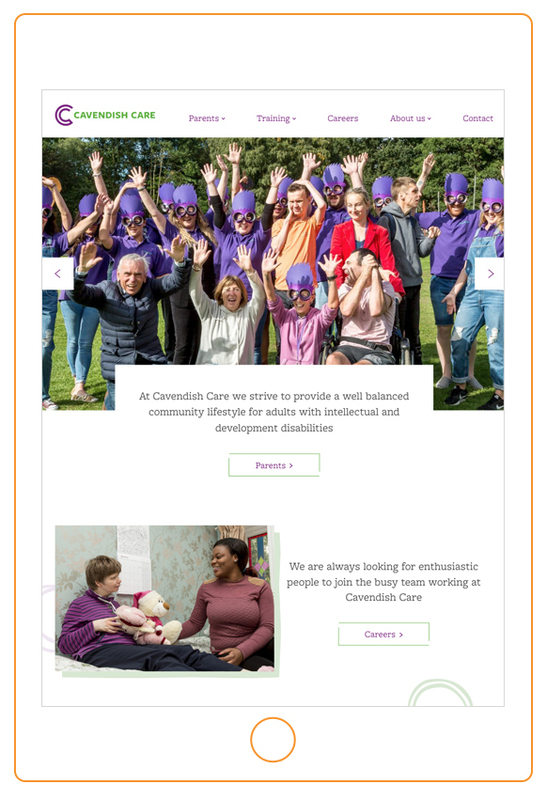 There’s more information about our work for Cavendish Care below – or just give me a call on 020 7351 4083.